After several years of soliciting collaborative projects, we are pleased to have funded two workshops that represent the collaboration model which we are focused on growing. They are The History of Sexuality and Gender Writing Workshop and Addressing the Challenges of LGBTQ Youth: Needs, Issues, Resiliency. We welcome further ideas of collaboration and look forward to funding them. 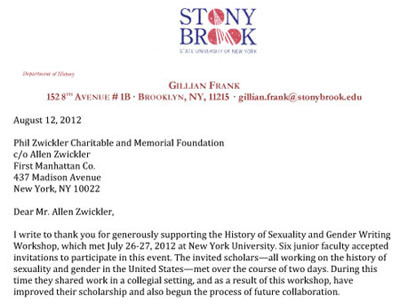 Allen was contacted by Gill Frank, a 2006 Phil Zwickler Cornell fellowship winner, to conduct a workshop with fellow scholars who are all teaching and preparing books on human sexuality. The PZ Foundation funded the 2 day workshop and Allen had a memorable lunch with the group. To read the full letter and personal notes from each of the workshop participants, please click on the image to the left. The third annual Phil Zwickler Memorial Writing Workshop for Historians of Sexuality and Gender took place on July 28, 2014 at Princeton University. To read the report, please click on the image to the left. Our second annual Phil Zwickler Memorial Writing Workshop for Historians of Sexuality and Gender was held at New York University on July 27-28, 2013. To read the report, please click on the image to the left. » To learn more about Safe Schools South Florida, please click here. 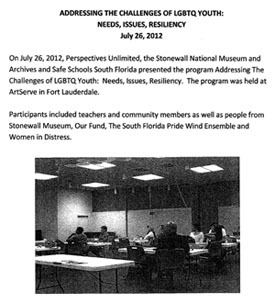 On July 26, 2012, Perspectives Unlimited, the Stonewall National Museum and Archives and Safe Schools South Florida presented the program 'Addressing The Challenges of LGBTQ Youth: Needs, Issues, Resiliency.' The program was held at ArtServe in Fort Lauderdale. How we came to this project is that Stonewall was a grant recipient in 2004 (click on the image to the left to read the full article, as well as an article about a collaboration between Stonewall and Cornell University), and Safe Schools South Florida President, Peter Gordon, is an old acquaintance of Allen Zwickler. In December 2012, Allen visited with Co-founder and Executive Director of Safe Schools South Florida, Robert Loupo, to follow up on the July 26 meeting. « To read an overview and report on the program, please click on the image to the left. 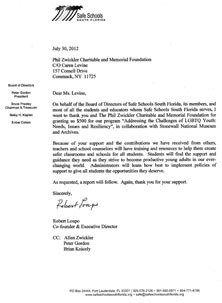 » To read a letter from Robert Loupo, the Co-founder and Executive Director of Safe Schools South Florida, please click on the image to the right. Tom Smith, a longtime friend and collaborator, was recently honored at the Founders Ball. Tom is near and dear to our family as he was Phil's caretaker in his final days. « Click on the images to the left to read more. We are thrilled to announce that David France's documentary, How to Survive a Plague, was nominated for an Academy Award in 2013! We also congratulate Jim Hubbard (a long time grant recipient) for the recent release of United in Anger. We are proud to have contributed footage from our archives to them. « Click on the images to the left to visit their websites.